Go even greener with your gardening! By signing up to the fortnightly garden waste collections you can save on trips to the recycling centre with your garden cuttings and clippings. 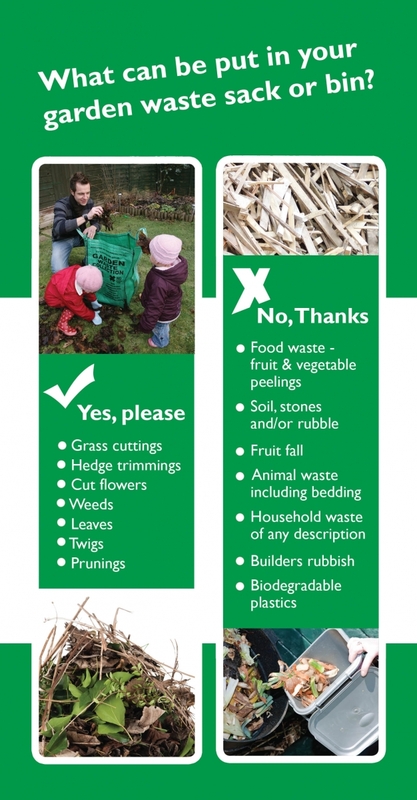 Here you can find out more about what you can and can't recycle in your garden waste bin. Please note: We are unable to provide refunds for our Garden Waste service. Find out where your garden waste is composted and where it ends up! As from 1 June 2017, Hart District Council will no longer be providing garden waste sacks for new subscribers following guidance from the Health & Safety Executive (HSE). Wheeled bins are the preferred option for customers and staff for this service as they reduce the implications associated with manual handling of garden waste sacks. Composting is an inexpensive, natural process that transforms your kitchen and garden waste into a valuable and nutrient rich food for your garden. It's easy to make and use. To encourage residents to get composting, Hart District Council has teamed up with Getcomposting.com to offer Home Compost Bins at special offer prices from only £19.98 (RRP £39). There is also a Buy One Get One Half Price Offer, adding extra value to residents with larger gardens or those who team up with a friend or neighbour to buy a bin. To see what’s available, visit www.getcomposting.com or call 0844 571 4444.